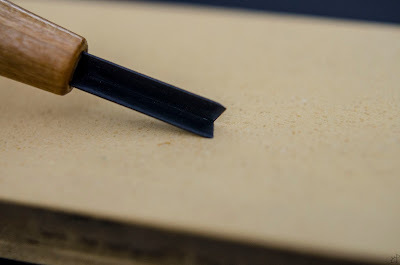 There are two main ways I have seen V gouges sharpened, and both of them begin the same. First, where each of the intersecting faces is treated as a skew chisel, and the point where they meet is naturally kept sharp by nature of careful holding of a constant angle while sharpening. 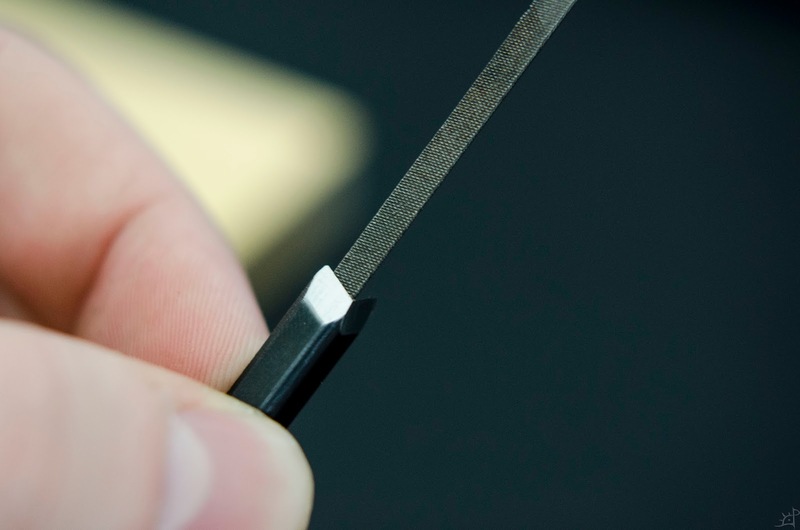 Second, after the two edges are sharp, the point between them rounded very slightly as though an extremely small round gouge so there is less of an intense line left by the meeting of the two faces. 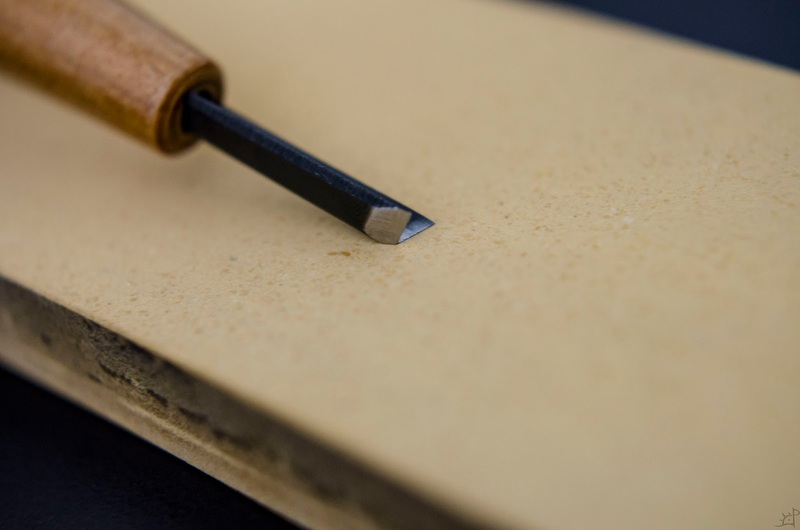 I personally do the first, leaving the point as sharp as possible, but that is because I use it solely for defining crisp lines, whereas I have a small gouge for the latter. In a previous post, I mentioned how I use files on my harder chisels to manipulate the burr. Here, I will demonstrate that method. Unlike with the round gouges, I cannot use the corner of the stone on a V gouge because the angle is less than 90 degrees. 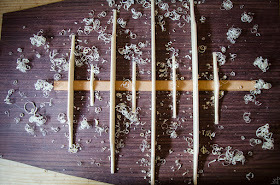 First, however, I begin sharpening as I did with a straight/skew chisel. Here, it is more important to keep an even lateral pressure on the cutting edge so each pair of points is not swept out from the centre. One trick to getting these sharp (for me) is to sharpen both bevels evenly. That is, not creating an excessive burr on one edge while the other is just barely beginning to form. For one, it will make removing the burr easier, and for another it is more effective at carving when the two edges are in plane with one another. Due to the hardness of the chisel, these needle files do not do much to the edge, but are fantastic at rolling the burr back to the outside of the bevel. I use a triangular file for the V gouge, and a double half-round for the round gouges. Here, the angle of the file is just slightly smaller than the angle of the V, so I can reach all the way into the corner. A few light pulls away from the edge is all it takes, and feeling for the burr on the inside with a finger tells you if it is enough. Once it is back to the outside, take a single perpendicular stroke across the stone with the bevel flat against it. This shears off the burr. I tend to go in a motion that has the corner of the V on the leading edge so any flashing that may be left over is on the outside edges which I hardly ever use. 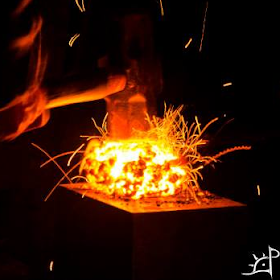 Once you are through all the stones, it's once again onto the strop. Here, pull instead of push, trying not to pull up on the handle through the stroke. Medium pressure and about 25~30 repetitions, periodically checking for a burr, and that's it. As with the round gouges, for the inner surface, I use the corner. 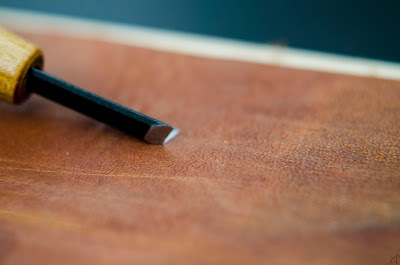 Because the inside of the leather is spongy, it conforms to the tight angle. 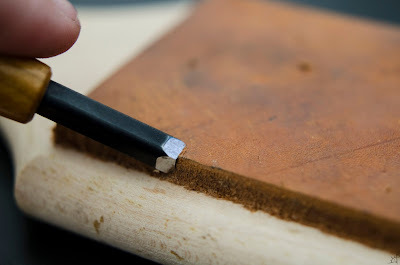 After stropping, check for sharpness, returning as necessary to the highest grit stone that can reasonably handle honing the edge to its sharp state.